The Toy Fox Terrier makes a wonderful companion and seems to anticipate his master's every thought and mood. Nothing escapes the keen hearing of the Toy Fox Terrier which, coupled with his alert nature, makes him an exceptional watchdog. The Toy Fox Terrier is an outgoing and friendly dog, yet fiercely loyal to his family. It is impossible not to spoil these funny, loving, intelligent, and utterly loyal little dogs. While, like most Toy breeds, the Toy Fox Terrier should not be paired with very young children, he is an exemplary companion for all ages. The Toy Fox Terrier is content and capable of any range of activities from hunting, to obedience, to just lounging around in the sun (or on the sofa!). Toy Fox Terriers remain playful all of their lives and never tire of entertaining their human companions. 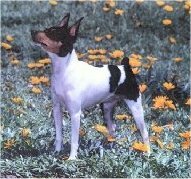 The Toy Fox Terrier is a wonderful breed. If you own one, you already know that. If you are considering one, I am sure you will find the Toy Fox Terrier is the toy breed for you. We look forward to welcoming you into the Toy Fox Terrier Community. The Toy Fox Terrier is a true American created by a loyal following who crossed small Smooth Fox Terriers with various toy breeds including Min Pins, Italian Greyhounds, and Chihuahuas. While retaining the terrier gameness, the crossbreeding with other toy breeds created a milder, more "livable" disposition. Although easier to live with, the Toy Fox Terrier is still a true working terrier and all around dog. 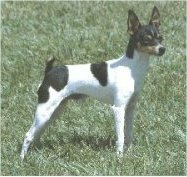 The Toy Fox Terrier was recognized by the United Kennel Club in 1936. The AKC approved the dogs to be shown in the Miscellaneous Class in July, 2000, making them eligible for obedience, tracking, and agility on that date and for AKC registration on April 1, 2001. January 1, 2003 marked their recognition in the Toy Group. The Toy Fox Terrier is an excellent apartment or housedog. They can make do with very little space to exercise because of their size. Although they love to explore their outdoor kingdom, the Toy Fox Terrier should not be kept outside continually. In cold weather a coat is necessary and a word of warning - Toy Fox Terriers do not like to be wet! They are economical to maintain because they eat little and maintain a neat appearance with no special grooming required. A quick weekly brushing to prevent shedding, nail trim, and an occasional bath is all that is necessary. Because of their superior intelligence, they are very easy to house train. Like all toy breeds, they are not recommended as companions for young children.